THE VILLAGES, Fla. — President Donald Trump's loyalists here at Florida's premier retirement community fear Andrew Gillum. It has nothing to do with his race, they insist, when asked about the 39-year-old Democrat who could become the state's first African-American governor. Instead, The Villages' deeply conservative residents are convinced a Gillum victory would trigger an era of high crime, higher taxes and moral failing. "He'll kill everything that's good about Florida," says Talmadge Strickland, a 66-year-old retired firefighter wearing a "Trump 2020" baseball cap at a rally for Gillum's opponent. "He will hurt us; he will physically hurt us with his socialist mentality." In an era defined by deep political partisanship, there's perhaps no state where the divide runs deeper than Florida, which is in the grip of a fierce culture clash over guns, race, climate change and the president. Gillum sits at the center of the melee, his campaign a proxy for the larger fight between Democrats and President Donald Trump's GOP. Gillum's fate is inexorably linked to fellow Democrats whose success could determine control of Congress. That's especially true for three-term Democratic Sen. Bill Nelson, who could benefit from Gillum's appeal among young voters and minorities. As early voting begins in Florida this week, that link is tenuous. "New voters and infrequent voters are everything to us winning," Gillum told The Associated Press when asked about his impact on Nelson's race. "I think they will vote for both of us, and that will be to his benefit." Young people and minorities are traditionally among the least reliable voters, particularly in midterm elections. Meanwhile, white voters in place like The Villages are lining up behind his opponent, former Republican Rep. Ron DeSantis. The electorate in Florida this year is especially unpredictable due to an unusual collision of events: a massive hurricane, the nation's deadliest high school shooting and Gillum's historic candidacy. DeSantis has benefited from Trump's occasional backing on social media, including after the debate. And Gillum is scheduled to campaign this week alongside former Vice President Joe Biden and 2016 presidential nominee Hillary Clinton. In the interview, he noted he's been in touch with former President Barack Obama, who may campaign on his behalf. Gillum acknowledged some Florida voters might oppose him because of his race, but insisted "that voter is not the majority of the people in our state." During Sunday night's CNN debate, he accused his Republican opponent of fanning racial animus ever since DeSantis first warned Florida voters not to "monkey this up" by electing Gillum. "The 'monkey up' comment said it all," Gillum charged. "He has only continued in the course of his campaign to draw all the attention he can to the color of my skin. The truth is, you know what, I'm black. I've been black all my life. So far as I know, I will die black." Meanwhile, a small, but significant portion of the state's Republican base remains consumed by recovery efforts almost two weeks after Hurricane Michael devastated the Panhandle. The secretary of state extended early voting hours, but both sides expect a drop in turnout across the heavily-Republican region as residents struggle without electricity and lodging in many cases. Nelson's challenger, Gov. Rick Scott, has yet to resume any campaign activities since the storm made landfall. The state's other trauma — a school shooting earlier this year that left 17 students and staff dead at Marjory Stoneman Douglas High School in Parkland — looms over the races. Backed by the fortune of Democratic billionaires Tom Steyer and Michael Bloomberg, Florida's young people are fighting to be heard. Those rallying behind Gillum in recent days include 16-year-old Sari Kaufman, a Parkland survivor who spent Sunday canvassing for the Democratic gubernatorial candidate. In an interview, Kaufman suggested young people are more excited about Gillum than Nelson, particularly because of Gillum's status as a younger candidate running statewide for the first time. "If he is successful and other candidates are successful, it will mean that my fellow classmates didn't die in vain," Kaufman said. African-American leaders are also working to reverse their community's typical drop-off in midterm elections. NAACP President Derrick Johnson said his organization is "microfocused" on boosting black turnout this fall. A statewide canvassing effort is underway across Florida, where organizers hope to bump black turnout by at least 5 percent from four years ago. Anne Fazio, a 19-year-old Jacksonville student, was among thousands of people contacted at home over the weekend by the Koch-backed Americans For Prosperity's massive door-knocking push. Standing at her front door, she didn't hesitate when a conservative volunteer asked whether she was going to vote. "I'm voting for Andrew Gillum," Fazio said, praising his support for gun control and expanding Medicaid coverage for hundreds of thousands of low-income residents. Asked by the AP whether she would support Nelson, she said: "I think I'll probably vote for him — he's a Democrat, right?" The Republican DeSantis is making little effort to expand his coalition as he embraces Trump and his policies in a state the president carried by 1 point. 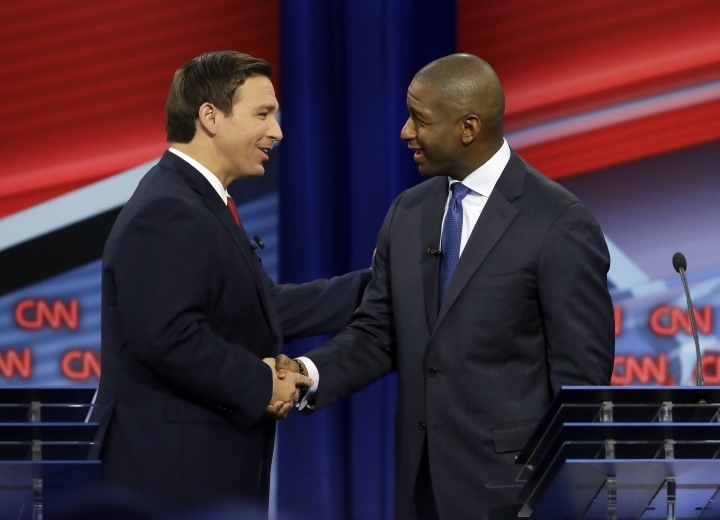 DeSantis vowed during Sunday's debate to work closely with the Trump administration, while noting that Gillum has called for Trump's impeachment. "You've got to be able to work with the administration," DeSantis declared. He also dismissed Parkland students' calls for stronger efforts to reduce gun violence when asked about his opposition to modest gun control measures passed by Florida's Republican-led legislature in the wake of the Parkland shooting. DeSantis said local law enforcement and school officials "let them down" by not acting sooner to detain the shooter and address his mental health issues sooner. Since the beginning of September alone, each side has dumped more than $44 million into television advertising for the governor's race. While that may be the most in the country, it's a fraction of the spending in Florida's Senate contest, according to political operatives tracking media spending. Paced by the Scott campaign's $50 million, the Republican side has invested nearly $79 million in television spending since April compared to Democrats' $49 million behind Nelson. Back at The Villages, the attack ads against Gillum appeared to be resonating with retirees gathered for a Saturday DeSantis appearance that drew about 400. "He scares me, I'm sorry," 75-year-old retiree Suzanne Zimmerman, a member of Villagers for Trump, said of Gillum. His race has nothing to do with her fear, she said. "Although Gillum does say that there are too many white men in government," Zimmerman added. "So that's unfortunate that he is actually a racist."